Disclaimer: I received a pair of Legend Compression socks to review as part of being a BibRave Pro. Learn more about becoming a BibRave Pro (ambassador), and check out BibRave.com to review find and write race reviews! 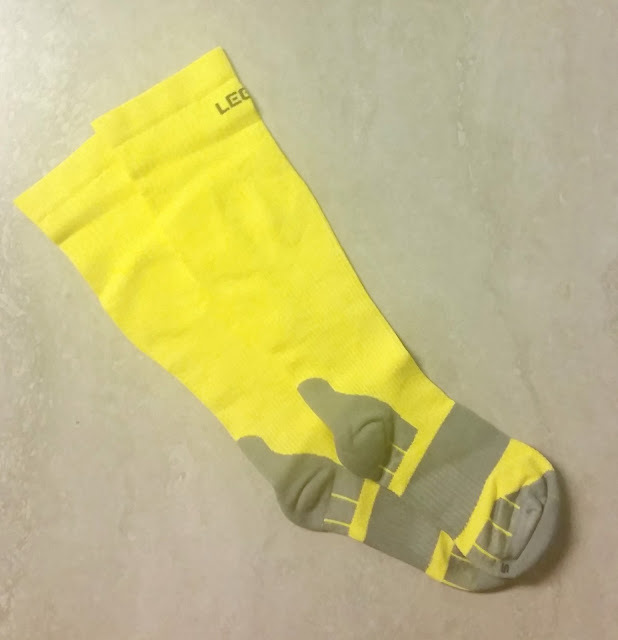 Recently, I had the opportunity to try out Legend Compression socks. To be honest, I'd never heard of this brand before I received them for my review, but I'm always excited to try out new compression socks. It's really interesting to see how different brands fit differently and where improvements can be made. When I first started wearing compression socks, I went nuts with crazy prints. I quickly realized that it was much harder for me to put together a Lex-appropriate outfit with the prints than with fun, solid colors. I'm more of a matchy-matchy lady than a mix-and-match lady when it comes to my fitness gear. I'm trying to push my fitness fashion comfort level, but it's still a work in progress. In the meantime, I'll keep rocking solid-colored compression socks! The pair I selected were these bright yellow beauties. I love that the socks came with little instructions for how to put your compression socks correctly. I, being the hot mess I am, often just squeeze them on haphazardly, they end up all crooked, and the lines end up in a spiral all over my legs. Hot. Mess. The best thing about these socks, in my humble opinion, is the open toe bed. I have had some serious problems with certain brands, where the toes have so much compression that it cuts off your circulation. I had that very problem when I ran my first 10k a few years ago, and I couldn't feel my toes and had to stop running to take my right shoe and sock off. I stopped wearing compression socks for months after that! With the Legend Compression socks, I can wiggle my toes freely and comfortably. The Legend Compression motto is "Right, Not Tight," and it's so true! My legs felt relief when I used them, without feeling heavier and immobile like they can with some other brands. It's so important to be able to feel the compression while still being able to feel your legs and feet! All in all, I'm in love with my new socks! They're comfortable, they're a fun color, and -- most importantly -- they work! 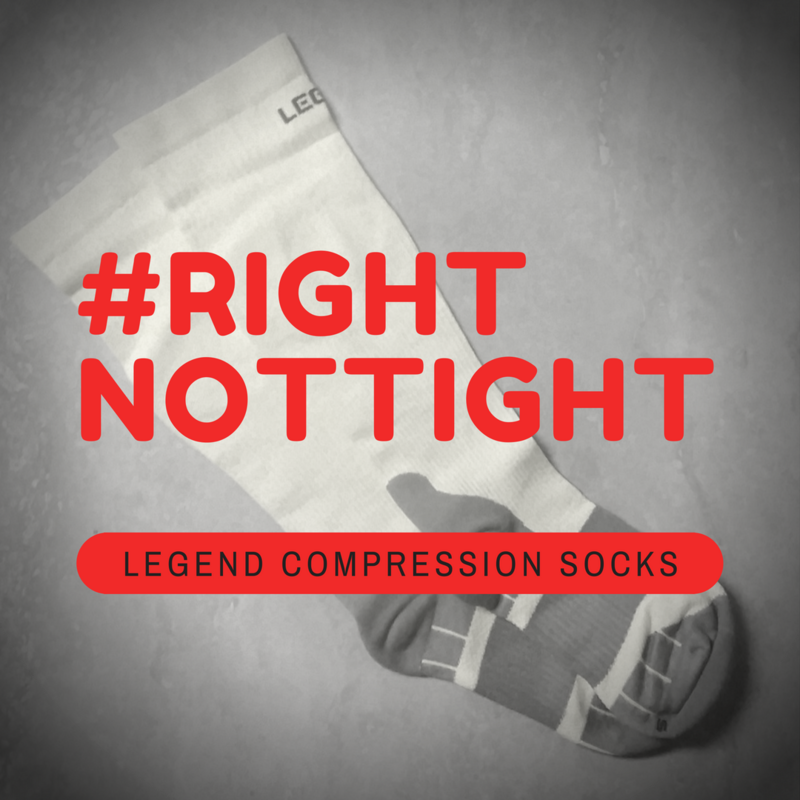 Interested in trying out Legend Compression socks on your own? Use the code bibsave15 for 15% off! Do you wear compression socks? Do you like solids or prints? Do you like wearing mismatched socks?